When you own a ProSource® showroom, you work one on one with your members to help them find the right home improvement product for their client’s home. It’s imperative for franchise owners and their showroom staff to approach their interactions with trade professionals in the right way. One of the most important aspects of fostering these business relationships is using active listening skills. You need to tune into what the member is really looking for, which will require fully focusing on getting all of the information you need to help them make informed decisions. That being said, active listening doesn’t mean sitting there in silence; you need to ask the right questions to get the answers you need. Here are the top questions to ask in order to help them find the perfect floor for their home improvement project. Where is the room, and how will it be used? The purpose and location of the room will have the biggest impact on what type of flooring is appropriate. If the space is ground level or a basement, moisture needs to be a factor that’s considered. In addition, if the project involves reflooring an entryway or any place that will see a lot of foot traffic, its durability will be the primary factor you keep in mind. Finally, you want to make sure that the floor is going to accommodate anyone with disabilities who lives in the house, so if any wheelchair or walker users will be in the home, it’s important that the flooring offers unobstructed movement. What color will go with the room? The color of the new floor will create a ripple effect through the room, totally transforming how it looks. Whereas lighter flooring colors will make the room appear larger, the signs of wear and tear will also be much more obvious. Dark colors add coziness to a room but reveal the dust and debris that accumulates much more obviously. If the room is colorful, it’s best to stick to a neutral color to avoid clashing with the paint or decor. Does this flooring work with their current floor? The overall decorating scheme of a home needs to make sense. This is why it is important for the flooring to transition seamlessly throughout the house. 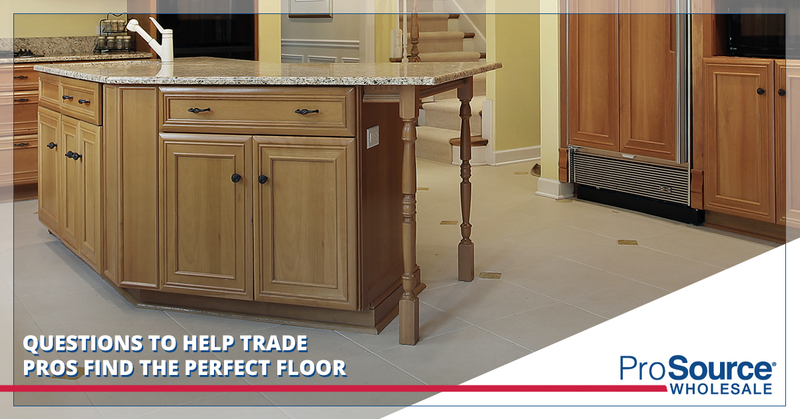 Ask the trade pro about the current flooring in the home to help them create interesting transitions between rooms and to ensure their choice reflects the overall interior design of the home. How much care can the client put in the floor? While there are many types of flooring at our showrooms that would likely look gorgeous in the home in question, customers must have a sense of responsibility to make sure they can maintain this product for years to come. If regular maintenance is going to be an issue, it’s important to opt for flooring options that require less time and energy from the client. For example, busy parents often don’t have the time to keep on top of the refinishing schedule necessary for certain hardwood flooring options. Do any of the residents have allergies? Many people don’t realize the impact their choice of flooring has on their health. For people with allergies, it’s important to reduce the impact that certain flooring choices have on the collection of dust in their homes. Carpet is not a wise decision for anyone concerned with indoor air quality, so it’s important to suggest hardwood flooring when your member’s client has any respiratory issues or allergies. Are they looking for a heated floor? Heated floors are becoming more and more popular in homes, but not all materials are appropriate for subfloor heating. If this is something the customer is interested in, talk to the trade pro about the options you have in stock that would work with heated flooring. These are just some of the questions that can help guide your conversation towards success when it comes to picking out floors. ProSource is a flooring wholesaler that genuinely cares about the success of every trade professional who walks through our doors. We provide ongoing training and a network of support to our franchise owners so they can be fully successful in following our system of success. If you are interested in opening your own ProSource showroom, contact us.